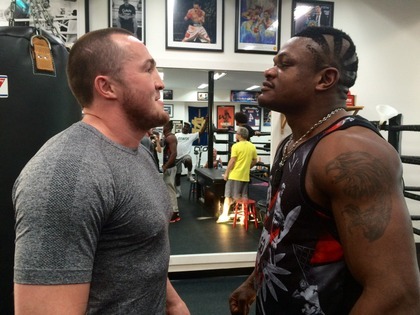 #1 Rated Challenger YOURI KALENGA and World Boxing Council (‘WBC’) Cruiserweight World Champion DENIS LEBEDEV “Faced Off’ for the first time at the Wild Card Boxing Gym in Hollywood, California in early February. In preparation for their world title fight, both warriors are opened up training camps in Southern California as Kalenga headed to Big Bear Lake, California with the guidance of ABEL SANCHEZ and Lebedev under the watchful eye of FREDDIE ROACH in Hollywood. “Seeing Lebedev this week was fantastic, he’s an impressive champion, clearly the best cruiserweight in the world and I’m thrilled to start camp to dethrone him,” said Kalenga.